Likhita - Telugu Editing Tool is available here for free download! We use Dynamic Font technology to display Telugu script. 1)Download TeluguFont from our site Click here to Download . 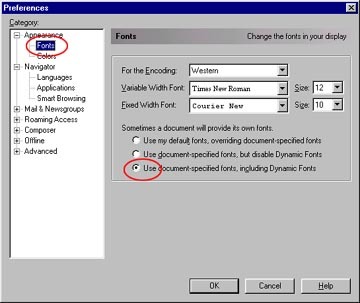 2)Copy font file in fonts folder in your system. 1) In IE 4, click on "View" Menu and then Click on "Internet Options"
In IE 5.0 and above, click on "Tools" Menu and then Click on "Internet Options"
ActiveX controls and plug-ins: "Enable"
Script ActiveX controls marked safe: "Enable"
Downloads --> File download: "Enable"
Access data sources across domains: "Enable"
Submit nonencrypted form data: "Enable"
Scripting by Java applets: "Enable"
If you are using an old version of Internet Explorer, then we strongly recommend you to download the latest version of Internet Explorer from Microsoft web site. It is free. Click here to goto Microsoft website. 1)Click "Edit" on the browser menu bar. 3)Select Appearance and click on it. 4)Now click on Fonts in the Category panel and enable the following option by clicking in the check box : "Use document-specified fonts, including dynamic fonts"
If the text is still not proper, then clear the browser cache. If you are using an old version of Netscape browser, then we strongly recommend you to download the latest version of Netscape Navigator from Netscape web site. It is free. Click here to goto Netscape website. If you still have a problem... Download the Font, it's so easy!! Click here to download the Telugu Font. 1. Choose "Save" or "Save this file to disk" option. Save the file on your desktop. 3. Click File option on window menu -> Install New Font -> Point the file location to your desktop and choose TeluguFont.ttf file -> then click "Ok"
4. Close all open browser windows. 5. Now open a new browser window and delete all the files in the cache and then reload or refresh the page. Follow these steps to Smooth your fonts. These instructions will work on Windows 98, Windows 2000 and Windows Me versions. 4)Click �OK� to close window and apply settings. If you still have any problems with your Telugu Fonts or Telugu Script display, then, please contact the Help Desk. Please explain your font problem in detail. Tell us your operating system name, the browser you are using. We will be happy to assist you! !